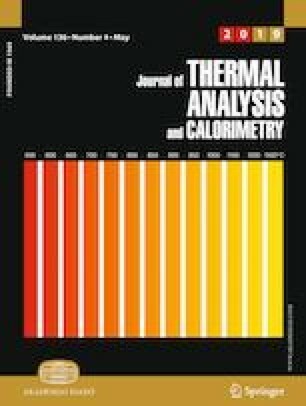 To have an insight into the fire properties of nitrocellulose–isopropanol and –ethanol mixtures, the experimental data in previous work are further extracted and analyzed carefully. Generally, the effective heats of combustion of the two samples characterized by both the peak and mean heat release rates decrease with the increasing external irradiance levels. The combustion efficiencies characterized by the ratio of carbon dioxide (CO2) to carbon monoxide (CO), regardless of the maximum and mean values, also show the similar decreasing tendency, exhibiting a lower combustion efficiency at elevated external radiation. With respect to the X-ray photoelectron spectroscopy results, the two nitrocellulose–alcohol mixtures appear to yield the similar species of combustion residuals, but slightly different in the atomic concentrations, which may be due to the differences in the alcohol humectant and nitrogen content in nitrocellulose substrate. These findings are expected to provide further understanding of fire properties of nitrocellulose–alcohol mixtures and help with fire investigation of such type of fires. This research was financially supported by Shanghai Sailing Program (Grant No. 18YF1409600), Natural Science Foundation of Shanghai (Grant No. 16ZR1414600), the National Natural Science Foundation of China (Nos. 51376172, 50909058 and 51408181), the Research Grant Council of the Hong Kong Special Administrative Region, China (No. CityU 11301015) and the Open Foundation of State Key Laboratory of Fire Science (No. HZ2016-KF13).